Choosing the right couples counselor is crucial to your success. Be sure to ask the right questions and understand what is what. So many people think counselors are interchangeable and the conspiracy is that counselors have unknowingly spread this lie out of shear ignorance. How have they done this you ask? The biggest way is by not specializing FOR REAL. They say they "specialize" on the internet but in real life they still see a bunch of different things. They think the consumer won't know any better...and until coming to this website many people haven't known anything different! They've become commodities because they aren't focused. Then they do terrible work because they aren't very good at anything. Then they perpetuate the belief that counseling doesn't work. Well...because it's not working when a therapist can't help you, right? They can't help you because they don't have enough time or money to keep up with the latest research and trainings to learn how to help you. They don't have enough money to learn how to help you because they can't justify raising their prices because they don't have a track record of success. They don't have time to learn how to help you because they feel like they have to see every issue and every demographic under the sun to pay the bills. They can't attract clients so they end up applying for insurance panels because surely they will get clients from insurance....and every possible client with every conceivable problem is what they get from insurance. Then insurance pays them even less then they were charging which perpetuates the problem. The deadliest most costly mistake someone can make is assuming they can find the least expensive therapist, or the therapist that takes insurance, and get the same results as going with the best. People wrongly assume that all counselors are the same and they all can do the same job and get the same results. People gamble their family on this, they gamble their life savings on this, they gamble their business and assets on this, and their life is at stake. This is the deadliest assumption someone can make. You wouldn't go to the jiffy lube to have your Porsche painted, right? No, because the quality would be drastically lower. You wouldn't trust a chiropractor with your open heart surgery, right? No, because that's not their area of expertise. Don't waste your valuable time and resources on a therapist who cannot help you. You sometimes only have one chance. At Marriage Solutions, at either or Tulsa or OKC location, you can find the help that you need. "Make sure your therapist has received specific training and is experienced in marital therapy. Too often, therapist say they do couples therapy or marital therapy if they have two people sitting in their office. This is incorrect. Marriage counseling requires very different skills than doing individual therapy. Marriage counselors, need to be trained in helping people overcome the differences that naturally occur when two people live under the same roof. They need to know what makes marriage tick. A therapist can be very skilled as an individual therapist and yet be clueless about helping couples change." Would you like to learn more about how we help couples? Click here to learn more. So You May Be Wondering How You Can Avoid The Mistake of Choosing the Wrong Therapist. The Answer Is Simple: Ask The Right Questions & Understand What's What. What kind of counseling do you do and what is your specialty? When you ask about specialty the answer shouldn't be a list of things. It should be one thing. Not 10, not 5, not even 3 things. Some examples of what is NOT a specialty is if a therapist says, "I see couples and individuals". That's not 2 things...that's an infinite number of things. In the couples arena when someone comes in with infidelity issues there is still a lot of complexity. There are 10 different types of affairs. Then there are couples where one person cheated and then other couples both people cheated. A good example of specialization would be "individual adults ages 25-55 with depression & anxiety", "teenagers with eating disorders", "kids ages 5 and under with autism". For us we help couples heal after relationship injuries. It's that simple. We use the only methods proven to work at our Tulsa and OKC locations. We have extensive training in Emotionally Focused Couples Therapy (EFT) and Experiential therapy (AEDP) for marriage counseling because they are the most effective (scientifically proven) methods for helping couples. 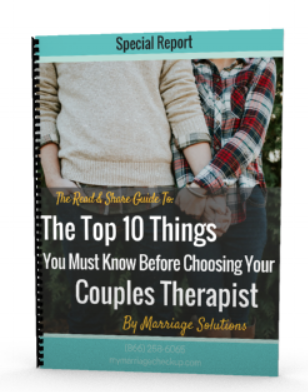 Other methods are referenced and utilized but EFT is the primary method for helping couples because it's the only method that actually works long term. What is the difference between couples counseling and family counseling? The difference really is the focus and methods employed by the therapist. Family counseling focuses a great deal on the relationship between parents and children and maintaining the pease between members of the family. These sessions typically include multiple generations so grandma, aunt, mom, dad, brothers, sisters, cousins, children all coming together to discuss the family problems. Couples counseling is very different than family counseling. Couples counseling focuses on the love relationship between two adults. The methods used for couples can be VERY different than methods used for a family. Insurance companies agree with that as well. They have completely different codes for both because they are not the same. If you have additional questions you can feel free to contact us directly or view the rest of our FAQ's. We also have a Resources page and blog section that includes helpful articles. At Marriage Solutions, we have locations in Tulsa and OKC so no matter where you live, you can find the help that you need. What's The Difference Between Counseling, Therapy, and Coaching? Counseling and Therapy are different words to describe the same thing. You can also throw in there Psychotherapy. That is another word to describe the same thing. These words describe the process of taking decades of research on human behavior and emotion and applying it to real world situations. We help you to heal by restructuring the experience you're having with your partner and yourself. Coaching requires us to draw from different techniques because we do it over the phone and via internet conferencing software. But if you consider coaching from a non-therapist what you get is vastly different. "Coaches" typically do not have any training. Literally, anyone can wake up one morning and call themselves a coach. Non-therapist Coaches are not requires to have training, there's no oversight, and no requirements for continued learning. People really gamble if they choose a coach. It's already enough of a gamble choosing a therapist who doesn't specialize. But at least a therapist is required to get a masters degree and education.